This pie was my favorite strawberry treat when I was a kid. My mom would always make it for us after she did her serious picking session, bringing home enough berries to make copious amounts of jam, shortcakes, and pie. I have never especially cared for the texture of strawberries once they are baked, so this pie always worked for me because you do not bake the berries. You do mash some up to make the filling, but since they are cooked completely down and turned into a jam/jelly-like substance, the texture is not an issue. You are left with fresh, whole berries and a strawberry jelly to hold it all together. The filling recipe is from Betty Crocker. My pie shell was a bit of a disaster, so I will spare you that recipe for now. You can use any pastry crust you like for the shell. I think next time I make this pie, I will add a little lemon or lime to the filling, just to add a little flavor boost. Rinse the berries, dry, and cut off the stems. Put about 1 cup of the berries in a saucepan with 2/3 c. water and bring to a simmer. Let simmer for 3-5 minutes, until the berries get soft and start breaking down. Meanwhile, mix together the sugar, cornstarch, and remaining 1/3 c. water in a small bowl. Add to the strawberry mixture and bring to boil. Boil for 1-2 minutes, until thickened, stirring constantly. Remove from heat and let cool completely. You don't want to put a hot mixture on top of your fresh berries, but don't let it set longer than necessary or it will firm up too much to spread nicely. 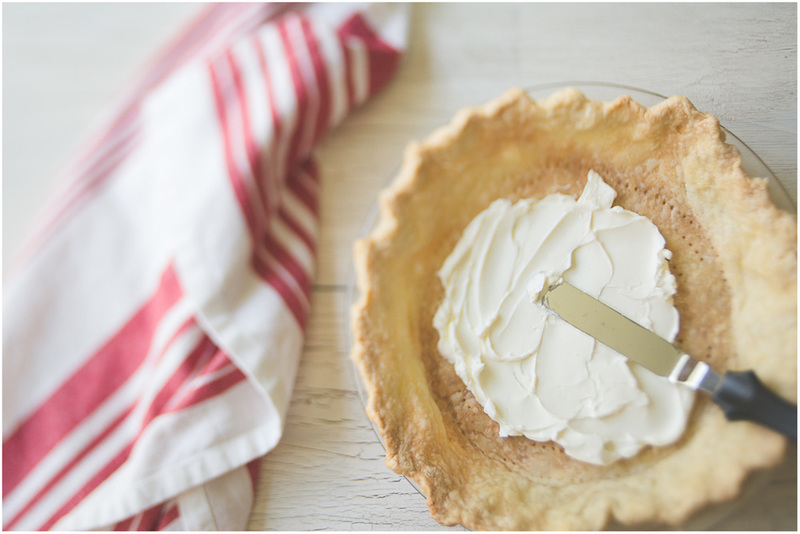 Spread the softened cream cheese over the bottom of the pie shell. It creates a tasty barrier between the pie crust and the filling so that you don't end up with a soggy crust. Then place the whole berries, cutting in half as needed to fit, into the pie. I make a reasonable effort to make this part look nice, meaning that I will cut down an overly large berry to make it fit in better with the others. I will also halve berries to fill in the gaps. You may have berries leftover that you can use as a garnish later. Pour your cooled filling mixture over the top. Spread evenly and then chill for at least 2 hours, but more if you can spare the time. If it chills properly, it will hold it's shape once cut. I only chilled for 2 hours for these photos and the pie could really have used more time to firm up. Top with freshly whipped cream and any leftover strawberries to serve.